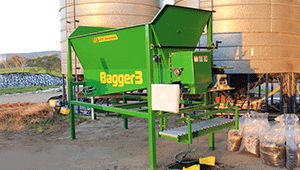 Bagger3HD is a larger 3m³ hopper/tank stationary bagger. 3m³ hopper/tank with a built in Digital fill timer, Compressor, Bag sealing unit and Bag handling roller table. It’s built-in forklift inserts, to allow safe and easy moment of the unit around to your worksite. The Bagger3 is equipped with a 2.2kW motor and a heavy-duty helical gearbox, easy roller table lift, adjustable sealer height, bag holder and bag lock. Industrial quality semi-auto stationary unit. OZ Turners Bagger`s are general purpose baggers machines able to handle a wide range of compost, mulch, soil, bark chips, gravel, pebbles and sand etc. The unit’s unique stirring/breaker unit in the front bulkhead, features a slick finger to break up lumps and keeps the bulkhead clear for easy flow to the chute. Optional adjustable metering plate can be fitted onto the bulkhead. 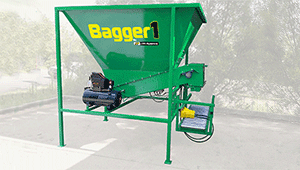 All standard Baggers come with bag holder, bag locking/holding mechanism during filling. 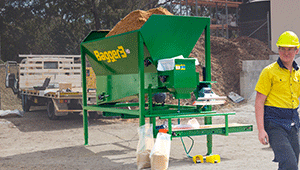 All OZ Turners Bagger`s are ideal for compost, sand, crusher dust, screened compost, small pebbles and similar products. While our standard chute will work with most fill, chutes can be specially designed and manufactured to achieve the best flow for your product and to suit your bag. 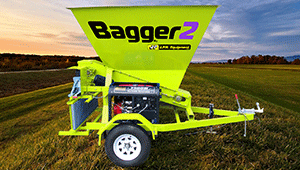 Every Bagger is designed and manufactured by JPH Equipment in Brisbane Australia. JPH Equipment have been designing and manufacturing quality equipment for over 25 years, with every. As small business, we have the ability to respond to your needs at all times throughout the design and manufacturing process and provide innovative solutions, and we are happy to work with your unique requirements. We keep our relationships with our customers personal and transparent, and our capabilities in design and manufacturing make sure you’re receiving the same depth and breadth of technical expertise that you’d typically find in a larger organization. We offer finance through our own finance broker. Our broker specialises in farm & small business finance and an allows us to best serve our customer’s needs.